History with a haunted twist. Join a historian on a 90 minute walking tour of historic Old Town Fort Collins to explore true tales of murder, mystery and mayhem. Visit locations where ghost sightings and the supernatural make this Choice City a true ghost town. This is a must for history buffs who also like a little haunted! Ghost hunting equipment is used on this tour. Tour may include basements. This tour lasts approximately 90 minutes and is offered Friday and Saturday evenings at 7:00pm departing from in front of Happy Lucky’s Teahouse and Treasures at 236 Walnut St., Old Town Fort Collins. Offered at 7:00pm on Friday and Saturday year-round for fun things to do in Fort Collins. 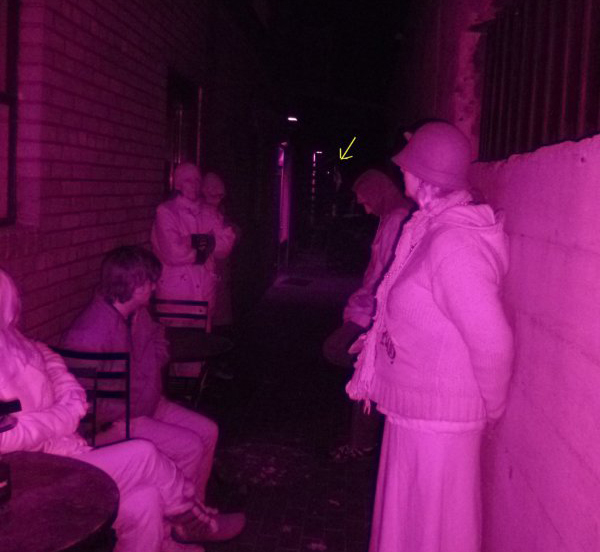 The Haunted History After Dark Tour requires at least four guests in total. We welcome individual reservations, but we may need to move the tour time or cancel the reservation without at least three other registered guests. If we do not meet the minimum group size, you will be notified 24 hours in advance for refund or rescheduling. Private ghost tours are available. Discounts are offered for groups of 10 or more. Please call 970-420-0662 or email Murphy@TheMagicBusTours.com to inquire about private tours. The Haunted History After Dark Tour departs on time from in front of Happy Lucky’s Teahouse and Treasures at 236 Walnut St., Old Town Fort Collins.